Chris Principe’s defamation case against Tim Tayshun continues, with the latest seeing a motion for entry rejected and filed answer to Principe’s complaint. Less than twenty-four hours after the deadline to respond had passed, Chris Principe’s attorney filed for an entry of default with the Court Clerk. The deadline to respond, as cited in Principe’s motion, was August 2nd. The motion for an entry of default was filed on August 3rd, the same day Tayshun filed a response to the complaint. On August 4th the Court Clerk rejected Principe’s motion because ‘the name of the person served does not exactly match the person named in complaint‘. Principe was given the option of refiling but evidently chose not to. Waiting less than 24 hours to file a motion for entry of default reveals that Principe might not intend the case to go to trial. Typically (as witnessed in the many MLM related lawsuits I’ve covered over the years), a plaintiff will wait at least a month before filing for an entry of default. The courts are pretty lenient with response deadlines, although longer delays typically require an explanation (and even then if the defendant has shown a good faith effort to respond judge’s are again pretty lenient). In any event with an answer now filed Principe now finds his lawsuit progressing towards trial. Tayshun’s response to Principe’s lawsuit is a mixture of admitting facts in Principe’s lawsuit, citing a lack of knowledge to respond to a number of allegations and denying the remainder. Chris Principe meanwhile continues to kick self-goals against his professional reputation. In his complaint against Tayshun, Principe claimed he’d never received compensation from OneCoin LTD or Ruja Ignatova. Whether Principe receives compensation from any of OneCoin’s numerous shell companies is unclear. 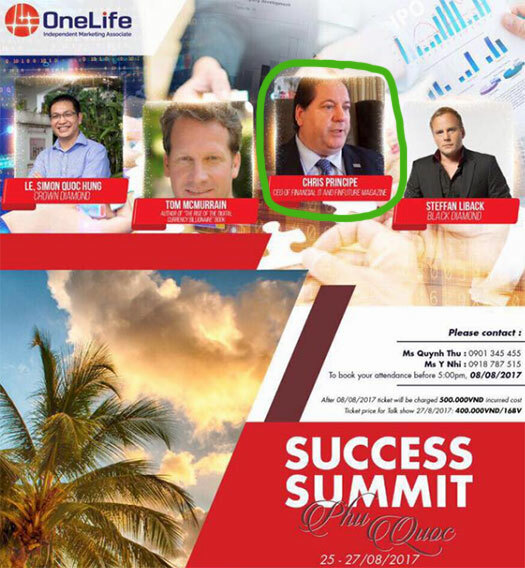 I imagine however it’s only a matter of time before discovery reveals how Principe is being paid to appear at OneCoin events. And how Principe intends to argue professional reputation defamation in court when he’s running around the world promoting a Ponzi scheme will certainly be interesting, but I digress. On August 7th Judge Staton set a Scheduling Conference for September 29th. A Joint Report must be filed between 14 and 21 days prior to that date and will likely be our next update on the case.